Here’s a bit of useful info from what I’ve been doing lately. I got a job to design a device that connects to a web-server via GPRS and downloads a bunch of tiny WAV files, that it later plays on a specific schedule. Now, there’s a jellybean part for this kind of task, and that is SIM900 (or SIM800), but I have a knock for “optimising” my electronics. Optimising in this context means making everything I can as cheap as possible, provided it doesn’t impact overall quality in a negative way. 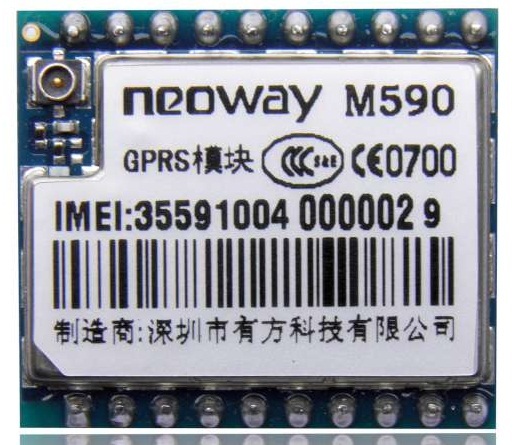 That’s how I came upon this el cheapo GPRS module – Neoway M590. It’s sold as an assemble-it-yourself kit at Aliexpress, and at the moment of writing this article it retails for as low as 2USD. More details on Vadim Panov’s blog. This entry was posted on Friday, June 10th, 2016 at 1:08 am	and is filed under tutorials. You can follow any responses to this entry through the RSS 2.0 feed. You can skip to the end and leave a response. Pinging is currently not allowed. What is the chipset inside? Bear in mind that this is a 2G module and that 2G is being decommissioned (December 2016/April 2017 depending on Telco in Australia). Other countries decommissioning 2G include Japan, South Korea, the United States and Singapore. What would be your suggestion for this module replacement? It’s getting to the point where it’s cheaper and definitely easier to use a Pi Zero or similar and a $20 3G USB dongle. Power consumption is horrible though, often sucking 5W or more, but you get real internet access and the ability to run fairly serious software. I’m working on a system at the moment that caches a bunch of observations in a low-power micro, boots a Pi+3G hourly to upload data, then turns the Pi off again. The downside is that you can’t contact it remotely except in a narrow time-window.